Cyrus Resort is nestled on scenic Bostic Bay just a mile boat ride from the legendary “Walleye Capital of the World,” on Lake of the Woods. 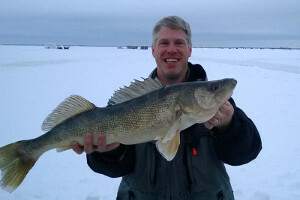 Cyrus, located in Baudette, Minnesota, is a full service, year-round fishing resort. They pride themselves in offering top-of-the-line customer service, in all aspects of their business. From the resort’s daily guided fishing trips to their tentative bar and wait staff, the Cyrus team will strive to keep you satisfied and wanting to return year after year. Cyrus is a family-friendly resort offering several amenities. Their newly remodeled lodge has a full-service bar, restaurant and fully stocked gift shop/office. 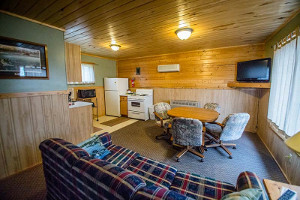 Their fifteen fully furnished cabins are accommodating for all group sizes. A playground, charcoal grills, paddle boats, and fire pits are available for use. If you’d like to bring your own boat, you can reserve an electrically equipped dock slip. Cyrus also has their own private boat launch and offers seasonal dock slip rentals. Oak Harbor Golf Course, Zippel Bay State Park, and Graceton Beach are a few of the other area attractions, located within minutes from the resort. For the full Lake of the Woods experience, let Cyrus Resort’s United States Coast Guard Certified Guides take you on the fishing trip of a lifetime, targeting trophy class walleye, and tasty sauger. You may even hook up to a jumbo perch, or northern pike. A nine-hour day of fishing includes gas, bait, rods, tackle, fish cleaning, and fish packaging. They have several fishing packages available, to fit a variety of needs. The resort also offers Meal Plan Packages, in which all your meals are included in the package price. With this option, you may choose to do a “shore lunch.” As you take in the beauty of one of the lake’s many islands, your guide fries your fish, potatoes, bacon, onions, bread with butter, and baked beans for you to enjoy picnic-style. After your fishing trip, let Cyrus’ chefs fry your catch of the day! They offer three signature house batters; lemon pepper, Cajun, and original. If you can’t decide, try all three! Fished out? Try any of their signature dishes, ranging from appetizers and gourmet burgers to delicious cuts of steak. The resort also serves full breakfast and lunch. Don’t forget, winter will be here before we know it! Be sure to book a fantastic winter getaway to Cyrus Resort on Lake of the Woods!